My own family were originally from the Armenians in Calcutta and Dacca, and although by the time I arrived my Armenian blood was somewhat diluted, I have been researching my Armenian family history for the last 7 years and time and again, found that there is little information available for anyone research their Armenian ancestors. So I hope I am helping a few people along the way. I still have more of the Nazareth graves to upload but these will take a little longer as I don't read Armenian so have to rely on someone else to transcribe them. Research Chater in India and Hong Kong in 2007? you might also consider including Dhaka, Bangladesh. There is an Armenian church in Old City Dhaka where the Armenian community of merchants lived back in the days, now there is one or two Armenians left to look over this church, there are graveyards I believe in the courtyard of this church also. I will google and include this youtube video that some American tourist took of this church. Good luck with your research. I would very much like to include the graves in Dhaka, which is where my family originated. So far, I haven't been able to make it there to take the photographs but it's on my wish list of places to go, as are the Armenian graves in Delhi and Agra. Thank you for your good wishes. I thought I would just let you know that I commissioned a photographer to take ALL the grve pictures at the Armenian Church in Dhaka, and I have transcribed the English one and uploaded them to my website www.chater-genealogy.com. Look for the dancing skeleton then Graves in Dacca. The Armenian written ones will be transcribed as soon as I can get them done. It has been some time since I made a posting so I would like to remind anyone interested in their Armenian family history in India that my website has had substantial updates during the year, with even more pictures and transcriptions of graves being added. Information is FREE so take a look http://www.chater-genealogy.com. In addition, I have put together a nostalgic look of the various Armenian churches in India and the Far East in a slideshow. The link can be found via my website, alternatively the direct link is http://myweb.tiscali.co.uk/emcjnd/. May I wish you all a very happy and peaceful Christmas and New Year. I like to wish you a Merry Christmas and a Happy New Year, with abundance of energy. The slide show was awesome and I thank you for it. Edited by Zartonk, 19 February 2010 - 12:40 PM. "THIS WAS SUCH A FANTASTIC DISCOVERY FOR ME AND THE FIRST I KNEW THAT I HAD ARMENIAN ANCESTORS IN MY FAMILY"
Liz Chater's dream is to record every birth, marriage and death in the Armenian community of IndiaLiz Chater's database of Armenians who have some connection with India over the last three centuries contains over 10,000 individuals and approximately 3,000 families. Liz Chater is a family history researcher specializing in Armenians in India and the Far East. In Liz's words, her web-site www.chater-genealogy.com dedicated to Armenian family history in India (1600-1950) fills a gap in that part of the history. Liz Chater was born in the UK where she still lives. Her interest is tracing her family stems from not knowing anything about its origins. In Liz's words, she didn't train to become a family researcher; she just fell into it by fortuitously in 2000. She knew quite a lot of family information about her mother's side (who is Welsh) but knew very little about her father's side of the family. Liz's father, who died in 1983, never talked about his family back in Calcutta. Liz's mother was able only able to partially answer the questions asked by Liz about her father's family. "I continued to try and find information and my search took me to the British Library in London which holds a great deal of information on Colonial India, as well as birth, marriage and death records. On my first visit there, I was lucky enough to be able to trace many members of my father's side of the family; many of whom had what I considered to have "odd" names, such as, Arathoon, Arakiel and Martyrose. I posted some queries to a genealogy mailing list and an Armenian researcher called Nadia Wright, who specializes in Armenians in Singapore and Malaysia, told me the names were Armenian. This was such a fantastic discovery for me and the first I knew that I had Armenian ancestors in my family," Liz Chater wrote to "Hetq". In her web-site she offers some possible definitions of the name Chater. According to one of these definitions, this surname could have derived from the Armenian word Adsvazaturian. In 2005 Liz was contacted by an unknown first cousin. He was interested to know about their family. "More importantly, he was able to let me see for the very first time, the Chater Family Bible which dates back to 1831 and holds all the names of my ancestors. This was an incredible moment - firstly when we met the resemblance we saw in each other of our parents and secondly, to be able to see that old Bible that had, over the years, travelled so many miles in its life! Since then we have been in regular contact and get together at various times of the year for different family occasions," Liz writes in her web-site. "Having discovered my Armenian heritage, I then tried very hard to find more information, specifically about Armenians in India," she writes to "Hetq". In Liz's words, many families of the Armenian community of India are inter-related. In the 19th and early 20th centuries it was not unusual for cousins to marry. So when Liz is working on one family she quite often solves a problem or query relating to another family. Her research timeline is predominately prior to the Armenian Genocide, between the 17th and the early 20th century. Since Liz Chater has gathered much information, many people ask her to help with their own Armenian-based family history queries. They in turn are happy to share their family details with Liz. And it is not unusual for Liz to actually turn their small amount of information into a much bigger picture; a larger family than they thought they had. "Internationally renowned artist, David Arathoon of Toronto, originally from Calcutta and whose Armenian family in India has been associated with the Armenian Church there for almost as long as the church has been standing, is probably the person that I have helped the most and whose own family tree hasn't just expanded but exploded with the new information that I have brought out into the open," Liz says. She is doing an "Armenian graves in India" photographic project. There are photos of Armenian graves in India presented in Liz's web-site. Many of these graves have duel inscriptions, in Armenian and English. But Liz still has several hundred photographs of Armenian graves whose inscriptions are written only in Armenian that she has not been able to put on her website yet because she doesn't speak or read Armenian. Thus, she completely relies on other Armenian family history enthusiasts to help her with transcriptions. She has approximately 3,000 photographs of graves in various locations in India. "To me, every cemetery and churchyard is a library and every grave is a book. I am able to gain so much valuable information from the various tombstones about the individuals and their families and that is why I am completely dedicated and passionate about photographing the Indian Armenian graves before they become so weather worn they are no longer visible. Once that happens you slowly lose the history and it doesn't take many generations before the graves are no longer remembered in terms of who they were. The Armenian graves in India are exceptionally well cared for but you cannot stop mother nature," Liz Chater says. When asked about the difficulties she most often faces in her work, Liz Chater answers that the lack of money to be able to research properly is the biggest obstacle for her. In her web-site Liz asks visitors to make donations to keep the web-site going. But in her words, she is lucky if she gets two modest donations a year. "At the end of each December when I have to renew the contract it's always a worry that I won't be able to run it for another year," she writes. Speaking about her professional plans for the future, Liz said that it would be a dream come true if she could turn her enthusiastic amateur researching into a career. Ultimately, she wants to be able to record every birth, marriage and death in the Armenian community of India from available church records. But since the early registers are written in classical Armenian, if she manages to copy the registers she then will have to find someone willing to help with the translations. Liz Chater said that researching family history is the fastest growing hobby in the UK. "How my family came to be in India is actually still a mystery for me," she writes. Who is the most under-valued Indian Armenian of the 20th century? Liz Chater said that the population of Armenians in India indeed is very small now. The community in Calcutta is less than 200. In other locations that were once large and economically strong communities, such as Chennai (previously Madras) they have all but disappeared completely. The bustling Armenian traders of Surat, Mumbai (previously Bombay) are but distant memories. But during colonial times Armenians were employed by the East India Company in positions of authority and importance because of their trustworthiness and dedication. "Armenians tended to anglicize their names so they blended in easily with the British colonial way of life. An example will be Catchick, Paul Chater's father. Originally known as Astwachatoor Pogos Astwachatoor, he worked for the Government of Bengal and was known as Chater Paul Chater. As far as I am able to tell, the Armenians in India have always strived hard to integrate into their surroundings. I know that the current Armenian students at the Armenian College in Kolkata learn the local dialects of Bengali as well as English and Armenian," Liz said. In her words, the hub of the Armenians is in Calcutta and it is the boys and girls educated at the Armenian College and Davidian Girls' Schools respectively that keep the flame burning. But for how long is anybody's guess. When asked if during her research she has found out information about a talented, remarkable Indian-Armenian, who isn't at all known in Armenia, Liz Chater answered that Sir Catchick Paul Chater (known as Paul) is probably the most under-valued Indian Armenian of the 20th century. Liz stumbled across this person on one of her trips to the British Library where she was collecting and noting every Chater name held at the library. "The name of Sir Catchick Paul Chater was the biggest discovery for me," Liz said. Catchick Paul Chater was born in Calcutta in 1846. His own parents came from the Armenian community of Baghdad, Iraq. Paul, although baptized in the Armenian Holy Nazareth Church of Calcutta, did not go to the local Armenian College, a long and established Armenian education centre first started in 1821, but was sent in 1855 to La Martiniere School for Boys in Calcutta. Paul Chater arrived in Hong Kong in 1864 with just a wooden chest containing his belongings. That wooden chest was always part of his household furniture; it was a reminder and a symbol of the life he had left behind in Calcutta. Paul got himself a job in a bank. He observed and learnt enough to branch out on his own as a broker within 2 years of his arrival. By 1869 he was a member of the Hong Kong Cricket Club. When His Royal Highness, Alfred, the Duke of Edinburgh visited, Sir Paul became a close friend and confidant of the royal family. He regularly visited Buckingham Palace and other royal residences and holidayed with the Duke and Duchess of Connaught in the South of France. By the 1870's, Paul was buying plots, building and renting out those properties. He had been joined by his younger brother Joseph from Calcutta and they had joint enterprises. Paul also saw the potential in pony racing and in the 1870's he set up a stable with his business partner Hormusjee Mody, a Parsee from Bombay. In Liz's words, it really is true that Paul never missed a horse race meeting in Hong Kong in 60 consecutive years between 1866 and 1926. He was Chairman of the Hong Kong Jockey Club for 34 years and he still holds the record of being the longest standing Chairman the Hong Kong Jockey Club. In 1890, Catchick Paul Chater created land from the sea in Hong Kong by constructing an extra 57 acres of ground space in a reclamation scheme. "It is the land that Hong Kong stands on today," Liz noted. In 1902, Paul was honored with a Knighthood in London for his contribution to the prosperity of the island of Hong Kong, something which never left him until the day he died aged 79. He had brought structure, stability, employment and social prospects to the island. "He generously left his beautiful and unique house Marble Hall along with his priceless china and art collection known as "The Chater Collection" to the government of Hong Kong, probably in the hope that they would make the house a museum. They did not. After a few very generous bequests to some nephews, Sir Paul Chater, a "closet" Armenian for the majority of his life, felt compelled to donate his remaining estate to the Armenian Holy Church of Nazareth, Calcutta where his life had begun," Liz writes. Thanks for picking up on the article, and placing it here, it is nice to know that people are interested. Armenian graves with the English translations beside them. get the English translations of them. Armenian graves onto her website. translating the Armenian graves at Surat for her. historians access to what has been, up until now, `locked' history. to get this information published. cooperation on its 194th foundation day. the children of the Armenian community. service and national anthems of India and Armenia were sung. the two countries," ACPA principal Soumitra Mallick told IANS. part of the bustling metropolis. located in Burrabazar in the central part of the city. Stephen's Court in Park Street, that boast of splendid edifices. shared socio-cultural ties for many centuries as new research shows. Armenian wives. She was also a doctor in the royal harem of Akbar. Armenian as the commander-in-chief of their army? to Persian upper class authorities. Zamzamah, meaning the lions roar cast by the Armenian Shah Nazar Khan. the Sikh chief Sardar Hari Singh Bhangi..
and economic ties with India long before this era. appear on the hospitable Indian soil. Cambridge University, held different posts in the High Court in India. Petrus son of Pogose, Avetick, the son of Malijan, Kirakose, Margar. Henrietta Aimee Elizabeth Simpson, née Stephen, lives in Edinburgh, Scotland. We were introduced by a mutual friend, the eminent British Historian, Dr Rosie LlewelIyn-Jones, MBE, of the “Nawabi Lucknow fame”. I was intrigued ever since Henrietta first told me in 2011, that her family is of British- Armenian heritage and that her ancestors were once domiciled in old Dhaka in the 19th century. I requested her to tell me the remarkable history of her family. A regular correspondence ensued between us. Slowly a story began to take shape supplemented by my own research. I also received from Henrietta some rare vintage photographs of her family, mostly taken in the Victorian era. The interesting story of the Stephen family, its initial diaspora from Julfa, Persia (Iran), domiciliation in 19th century colonial India and final migration to Britain is a fascinating one. It all begins with Henrietta's Armenian great-great-great grandfather Johannes Stepannosean (later anglicized to Stephen) , who left Julfa once the pontifical seat of the Armenian Church in Ispahan, Persia (Iran) in the early 1800s to come to Calcutta, then the thriving capital city of British India. What circumstances actually impelled him to do so is not known. But it was perhaps the lure of trade and commerce in colonial Bengal. The ethnocentric, industrious Armenian community in both Calcutta and Dhaka were already well established. Some had indeed become prominent and prosperous citizens by then. These facts must have influenced Johannes to try his luck also. Although he first arrived in Calcutta, he soon relocated to Dhaka, where he engaged himself in trading. There is no mention of his first wife who was the mother of at least two of his older sons, one of whom was popularly known as,” John Stephen Esquire of Dacca” (born 1823) and Carapiet/Carr Stephen (born 1835). It is also not clear if his first wife had actually died in Dhaka or was divorced by him after the birth of their son Carapiet/Carr Stephen in 1835. In 1838 Johannes who must have been doing well by then, married a Greek lady named Sultana Athanes, presumably his second wife at the Greek Church in Dhaka. The church built by the Greek community in 1821, was once located a little inside the then Muqim Kuttra road east of the Chawk Bazaar. It was destroyed in the great earthquake of 1897 and was never rebuilt. In Dhaka, Johannes Stephen (1790-1843) lived in Armanitola, then a predominantly Armenian quarter. He had a large family. He sired according to available records seven sons from his two marriages. However, there is no mention of a daughter or any other wife apart from Sultana Athanes. Johannes died in 1843 and was buried in the Armenian Churchyard in Armanitola, Dhaka. The seven sons of Johannes are: Stephen Stephen, John Stephen Esquire of Dacca (1823-1876), Hume Stephen, Carapiet or Carr Stephen (1835-1891), Arathoon Stephen, Mackintosh Stephen and William Stephen. Of his sons, the one worthy of mention, in particular, for the continuation of our story is the great-great grandfather of Henrietta. Even today, he is fondly remembered in the Stephen family as, “John Stephen Esquire of Dacca.” Nothing much is known about him or his life spent in Dhaka, except that he was a man of means and thus prosperous. He may also have been a landholder or Zamindar in Eastern Bengal. In reading the scant information available on the Dhaka Armenians, one will invariably come across the surname, Stephen, listed along with other illustrious Armenian names of the 19th century. Johannes's son, John Stephen Esquire, is said to have married at least twice. His first wife Catherine (1836-1861) lies buried in the St. Thomas Anglican Church, Dhaka. Her epitaph reads on marble: “In affectionate memory of Catherine. The beloved wife of J Stephen, Esq, who died 10 December 1861. Aged 25 yrs 3 mths 17 days. I shall go to her but she shall not return to me.” On the other hand, John Stephen Esquire is buried in the Christian graveyard at Narinda, Dhaka. His grave has a white marble base. His epitaph simply reads: “JOHN STEPHEN Esq of Dacca. Born 5 October 1823. Died 27 November 1876”. John Stephen Esquire, was a close friend of one of the most prominent and influential Armenians of Dhaka in the 19th century, named Nicholas P. Pogose alias Nicky Pogose. The wealthy Nicky was also a pioneer educationist who had established the once famous Pogose School in Armanitola, old Dhaka in 1848. He was Godfather to St. John Stephen, son of his good friend John Stephen Esquire on his baptism in 1854. The Stephen family in Edinburgh, Scotland, still possesses the silver dish presented to St. John Stephen on his Baptism by Nicky Pogose. Along the inner rim of the silver dish is a simple engraved inscription which reads: N P Pogose to his Godson St. John Stephen. It is not dated. But there is no doubt in the Stephen family that it was gifted to St. John on his Baptism day in 1854. The beautiful silver piece was most probably crafted by skilled silversmiths for which Dhaka was renowned in the past. As far as can be traced, John Stephen Esquire had three sons and two daughters. It is not possible to tell now which of his children were borne by his two wives, Catherine and Lou. The names of the children are St. John Stephen ( born 1854) and Godson to Nicky Pogose, Carr Stephen (1859-1896), who was the great grandfather of Henrietta and another son whose name remains unknown. The names of the daughters are Rosaline or Rosie Stephen (1857-1938), who died in England and, Kate or Katie who was unmarried and also lies buried in England. Caar Stephen (1859-1896) described as the third son of John Stephen Esquire, was a prosperous land agent in Dhaka with business interests in Calcutta and Rangoon, Burma. He married Primrose Saunders and had a son Christopher Gerald Stephen (1890-1954), Henrietta's grandfather, who was born either in Dhaka or in Calcutta. Gerald Stephen, was educated in England. He joined the Royal Fusiliers in the British Army and fought in the First World War. During the War he was briefly stationed at Fort William, Calcutta, in 1914. It was in Calcutta that he met his future wife Hetta (Ivy), while she was on her way to meet one of her brothers in the North West Frontier. He married Hetta (Ivy) who was born in Grenada in the British West Indies in 1889. Both eventually died in Britain - Christopher in East Sussex in 1954, while Hetta in Croyden, Surrey in 1968. They had a son, Henrietta's father, Michael Gerald Stephen (1916-1975), born in London. Michael married Joan (1918-1971). He too, served in the British army but never visited India in his lifetime. He and wife Joan, lived in Sussex, with Henrietta where he died. Their daughter Henrietta, born in 1950 in Crowborough, East Sussex, attended a private Anglican convent boarding school called St. Mary's in Wantage, Oxfordshire, England. It is a community of St. Mary the Virgin. This ecclesial order has an institutional presence in Poona, India. Henrietta's siblings Richard Stephen (born 1952) lives in Denmark, while twin brothers St. John Stephen and Roland Stephen (born 1957), live in London and in Maryland, USA, respectively. Henrietta is the sole narrator of this 'human interest story' of the Stephen family. From Julfa in Iran to colonial Bengal and finally emigration to Britain, the trail of the Stephen family makes for compelling reading. Due to lack of more detailed information, it is not exactly clear when this Armenian family started to lose its Armenian identity by inter-marriage with other Europeans belonging to different Christian denominations and assimilate into a larger world. It seems evident that with the exception of Johannes Stephen all other male members of the Stephen family lie buried mostly in Anglican Christian cemeteries, instead of Armenian churchyards. It is also not sure as to when members of the Stephen family started to immigrate to Britain. The earliest on record to have done so, are Kent Hume Stephen (1857-1907), Rosaline/Rosie Stephen (1857-1938) and Kate/Katie Stephen all of whom are buried in England. But it seems certain that Christopher Gerald Stephen (1890-1954), Henrietta's grandfather, who was either born at Dhaka or in Calcutta, was a more recent migrant to Britain from the family. His son Michael Gerald Stephen (1916-1975) and grand-daughter Henrietta both born in Britain are, therefore, British with an Armenian legacy and the fascinating 19th century old Dhaka connection. Though born and brought up in Kolkata, it is only recently that Brunnel Arathoon, 36, started examining her Armenian roots. All these years, Arathoon says, she had only the one identity, of a Catholic; her paternal origins in the Eurasian country remained a footnote in family dinner-table conversations and a conundrum in social circles. “I had absolutely no idea of my Armenian identity and the history surrounding it. After I got to know of my father’s side originating from Armenia before shifting to Kolkata, I started looking up the map of the country. It is nice to know where one goes back to,” says Arathoon. For the first time, she has baked the traditional Armenian Christmas cakes— spiced with nutmeg and cinnamon and stuffed with walnuts, and, unlike most other Christmas cakes, without fruit. They are a marker of her Armenian roots, a country from where large numbers came to settle down in Kolkata and do business, as far back as the late 17th and early 18th centuries. Though the British are popularly believed to have been the first Europeans in Kolkata in 1690—Job Charnock, an employee and administrator of the British East India Company, is regarded as the founder of the city now called Kolkata— the discovery of an Armenian tombstone in the city dating back to 11 July 1630 has pushed back Kolkata’s European links by at least another 60 years. The site of the tombstone of Rezabeebeh, “wife of the late charitable Sookias”, is the Armenian Holy Church of Nazareth near Burrabazar, built in 1707 and widely regarded as the oldest surviving church in Kolkata. It stands as a monument to the city’s earliest encounter with Christianity, even as the number of Armenians has dwindled to an official estimate of less than a hundred. Arathoon, however, contends there are many like her: uncounted Armenians grappling with issues of identity, since only Armenians who are baptized are counted. Brunnel Arathoon with her children, decorating her Armenian Christmas cakes. Having bagged orders for 56 cakes within a few days of promoting her effort on Facebook, Arathoon hopes the world will now come to know of her Armenian background. “Christmas in Kolkata is as good a time (as any ) to spread the word,” says Arathoon. We meet one evening at a café attached to a book store in the Park Street area. It’s a week before Christmas, and Park Street is a merry swirl of revellers in red and white Christmas caps, caught ethereally within a dazzle of blue and white lights. On 16 December, West Bengal chief minister Mamata Banerjee inaugurated the state government-organized Kolkata Christmas Festival in this area’s Allen Park. This nearly three-week-long festival, which has been organized since 2011, sees street-corner pop-rock concerts, dancing, choir performances, parades, Christmas merchandise, roadside stalls selling Anglo-Indian beef roasts and pork vindaloo, and a heady maze of festive illumination running across Park Street and the St Paul’s Cathedral-Victoria Memorial area. At around 14-15 degrees Celsius, this year’s winter temperature is just adding to the cheer. On 25 December, Park Street turns into a pedestrian-only zone, with thousands of people in their Christmas finery taking it over. This year, Banerjee spoke about visiting churches at midnight on Christmas Eve even when she was not chief minister. Her comparison of Christmas celebrations to Durga Puja almost echoed the campus saying in Kolkata that describes 25 December as a day dedicated to “Jishu (Jesus) Pujo”—a day when many non-Christian Bengali homes will bake or buy cakes, party at clubs, visit the zoo, St Paul’s Cathedral or Park Street, perfectly at ease in their red Xmas caps. Youngsters can often be seen in red Santa Claus clothes, complete with faux white beards, while the Santa illuminations put up by the Trinamool Congress-run state government glow in blue and white—red is not a colour it favours. Bengali gospel songs played over public address systems and Santa cutouts in dhotis complete the appropriation of the occasion by even those who are not Christians. Christmas decorations on sale at Free School Street. Certainly, it has developed its own local flavour over the years—and tourists tend to flock in droves during this period. Private tour operators, hoteliers and restaurant owners report more traffic. “Christmas in Kolkata is certainly becoming a brand ever since the festival in Park Street started. 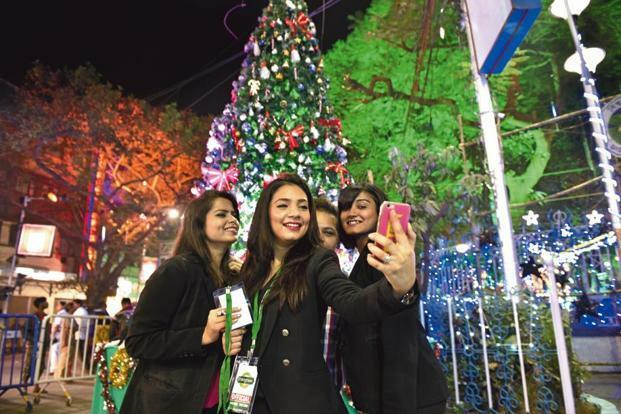 An entire new segment of tourists has come up for whom Christmas celebration in Kolkata is the most happening after Goa,” says Anil Punjabi, chairman (eastern region) of the Travel Agents Federation of India. Week-long Christmas packages have been introduced by travel companies, he says, with two-day visits to Darjeeling or the Sunderbans thrown in with a five-day stint in Kolkata. Last year, tourist arrivals in Kolkata during this period saw an 18% increase over the previous year, topping an average annual growth of 10-15% since 2011, says Punjabi. He is seconded by Sudesh Poddar, president of the Hotel and Restaurant Association of Eastern India, which has 800 business establishments, including five-star hotels such as Taj Bengal and JW Marriott Kolkata, as members. “Last year, we accounted for a 25% increase in business. Christmas in Kolkata is already a beautiful event but more areas should be added as festival venues,” he suggests. They are yet to map the effects, if any, of demonetization. Over the years, indeed centuries, Christmas celebrations in the city have evolved. For it was once the capital of British India, with Kolkata being the first port of call for boatloads of European missionaries in India. Between the 17th and 18th centuries, the Portuguese, Danes, Dutch and French all set up camp in the vicinity of Kolkata, often with the intention of proselytizing. Instances like the conversion of poet Michael Madhusudan Dutt to Christianity may be few, but Bengalis in 19th century Kolkata, closer to their roots but familiar with Western thought, chose an amalgam of both worlds. The Brahmo Samaj, founded in 1830, and helmed during different periods by reformers like Raja Rammohan Roy, Debendranath Tagore, Keshub Chandra Sen and Rabindranath Tagore, emerged as a prominent Hindu reformist movement that sought to give women a respectful position in society, including the right to education and property, eradicate superstitious practices, return to the Upanishads, ensure exposure to the Western world and battle the caste system, according to Nitish Sengupta’s book, History Of The Bengali-speaking People. Indeed, “during the Christmas celebrations in 1864, a group of Brahmo youth, under the inspiration of Keshub Chandra Sen, brought their wives out of the purdah and introduced them to their male friends, thus taking the first steps towards free mixing”, notes Partha Pratim Basu in Strangely Beloved: Writings On Calcutta, edited by Nilanjana Gupta. At the Visva Bharati university campus in Santiniketan, founded by Rabindranath Tagore, author Nabaneeta Dev Sen remembers Christmas being celebrated as Christo Utsav, with prayers, hymns and Brahmo songs being performed without the presence of any religious motif or motive. “I’m not sure why Tagore started this practice, especially since Santiniketan didn’t celebrate Durga Puja. Maybe it was his way to intellectually remember the day by being religion-neutral,” she says. On 16 December, when the large audience present at the hallowed Indo-Gothic St Paul’s Cathedral, built in 1847, heartily applauded the Christmas concert of the Kolkata Music Academy (KMA) Chamber Orchestra conducted by Abraham Mazumder—which included a rendition of three Tagore compositions other than those of Beethoven, Purcell, Mozart and Christmas carols—it could well have been celebrating the spirit of inclusiveness that sees people of all faiths coming together for Christmas in Kolkata. “Brahmo Sangeet (Brahmo music popularized by Tagore) is actually church hymns, though he kept out the harmonies. Tagore knew the value of music and humanity was his religion,” says Mazumder. For the oldest Christian community in Kolkata, the Armenians, the 25th is the beginning of the period of “Advent of Jesus”, not the day they celebrate Christmas, says Anthony Khatchaturian. Khatchaturian, a prominent Armenian in Kolkata, organizes popular city walks; this year, a “Cake Walk” through the city’s popular Christmas cake outlets has been introduced. It is only on 6 January, when the period of Christ’s incarnation culminates, that the oldest church in the city, the otherwise deserted Armenian Holy Church near Burrabazar, will swell up with the sounds of prayer and singing. Bow Barracks gears up; and (below) celebrations at New Market. The ghetto-like residential area of the city’s Anglo-Indian community in central Kolkata throbs with parties, concerts and balls on the road. Don’t leave without tasting the homemade wine and the meat-heavy food. The Christmas festival starts on 23 December, taking a two-day break—25 December and Boxing Day—before it begins again on 27 December. New Market, built in 1874, has a timeless aura. A visit to the area is never just about shopping, it’s about diving straight into the pulsating heart of the city. There are Christmas trees, silver bells and golden balls everywhere. Don’t miss a bite at Nahoum, a quick detour for cold cuts at Kalman Cold Storage or a stroll around the moody Free School Street, now called Mirza Ghalib Street. This is among the city’s leafiest areas, with the imposing St Paul’s Cathedral and Victoria Memorial, the sprawling Maidan and the Nandan cultural complex in the vicinity—it’s just the right place to laze in the winter sun. Christmas in Kolkata is incomplete without a visit to its many British-era social clubs, like the Calcutta Club, the Bengal Club and Tollygunge Club. An uppity air and warm hugs go down with gin and tonic here. They organize concerts and belly-dance performances. Kolkata’s many nightclubs ring in the season with late-night gigs featuring EDM, exotic dancers from all over the world, cabarets, even fire-eating acts. With the state government allowing only four-and-a-half dry days annually and clubs remaining open till late, the party tap never quite goes dry. 'Hayastan', or Armenia in English, is a small landlocked country sandwiched between Turkey to the west, Georgia to the North, Azerbaijan to the East and Iran to the south and it is steeped in history. The first country in the world to officially adopt Christianity, the country has played an important role in history. As travelers, merchants, and financiers, Armenians seem to have made the world their own, throughout history. In fact so entrenched were they in the Mughal court in India, that during the liberal rule of Emperor Akbar - a Mughal Queen - one of Akbar’s wives, his Chief Justice and some of the most influential merchants and financiers of the time, were all Armenian! It was St. Gregory, whose enormous statue stands behind St. Peter’s Basilica at the Vatican, who played a pivotal role in making Armenia a Christian nation with the full support of its ruler King Thiridates III. It must be remembered that the faith was brought here by Jesus' own disciples Thaddeus and Bartholomew. But the faith evolved in a unique way. The Armenian Orthodox Church, a branch of Christianity, has its own Pope – the Catholicos who is based in the capital of Armenia, Yerevan. The very first Catholicos was St. Thaddeus, while his more famous fellow disciple Peter became the first Pope of the Roman Catholic Church. The Ottoman and the Safavid conquests of the Armenian highlands in the 15th century CE meant that many Armenians left their home country and dispersed across the Ottoman and Persian empires, in search of better fortunes than were available back home. They established themselves in Constantinople, Baghdad, Isfahan, St. Petersburg and even at the Mughal capitals of Delhi and Agra. While their Zoroastrian friends chose the sea route to India, arriving first in Gujarat, the Armenians went overland with the Persian camel caravans through Persia, Bactria (Afghanistan) and Tibet, then finally to Delhi and across to Bengal. There is very little evidence of Armenian settlements in India before 16th century CE. However, the book 'Armenians in India' by Mesrovb Jacob Seth states that the oldest reference to an Armenian in India dates back to the year 780 CE, when an Armenian merchant named Thomas Cana landed on the coast of Malabar and was given trading privileges by ruler of Kodangallur . The book states that the story of this merchant is mentioned in several chronicles of Christians of Malabar, who refer to him as Kanyi Thommam or Kana Tomma. However, it was in the 15th century CE, in the court of Akbar, that Armenians gained great positions of power and influence. One of Emperor Akbar’s wives – Mariam Zamani Begum; his Chief Justice – Abdul Hai; the lady doctor to the royal court – Juliana and even a personal friend, Hakobjan, were all Armenians. Akbar provided land to them to build a church, which came up in 1562 CE. Another Armenian, Iskander, married the Chief Justice’s daughter. One of their sons was the famous Mughal poet Mirza Zul-Qarnain (his birth name was Alexander), who was close friends with Shah Jahan. When Zul-Qarnain’s father died in 1613 CE, he was earning 5-6 lakhs a year from the salt farms in Rajputana and even owned a jagir. Zul-Qarnain was very close to the Mughals, having been childhood friends with Shah Jahan and served with his son Sultan Shuja in Bengal in 1645 CE. He also served with Shah Jahan in Kashmir in 1651 CE and again in Lahore in 1652 CE. ‘This Armenian had been brought up with Cha-Jahan, and in regard he was an excellent wit, and an excellent poet, he was very much in the King’s favour, who had conferred upon him many fair commands, though he could never either by threats or promises win him to turn Mahometan’. It was also an Armenian in the court of Farrukh Sayar who helped the East India Company get their ‘Grand Firman’ in 1715 CE, Khojah Israel Sarhad. Sadly, Armenians were not very good chroniclers and so there are hardly any first-hand accounts from within the community. The only exception seems to be the Armenian historian of Bengal, Thomas Khojamall. Writing about the East India Company’s rise in eastern India, he provides us with the first clues about Armenians away from the Mughal court in Delhi. Khojamall lived during the reign of Shah Alam at Allahabad and wrote his accounts in 1768 CE. His manuscript was lost for decades, having being passed around the Armenian community until finally Colonel Jacob, the Armenian Brigadier General in the Maharaja of Scindia’s army, got hold of it and gave it to an Armenian Bishop, who again sat on it until it was finally published in 1849 CE. In Bengal, Armenians played both sides of the fence with the Indians and the East India Company. Clive refers to his confidant “...the Armenian Petrus”, Petrus Arathoon. Meanwhile, his brother Gregory Arathoon had become the Commander in Chief of Mir Jaffar’s army, having adopted a name that would blend in better – Gorgin Khan! Armenians continued to play major roles across India under various rulers. In Bengal, Sir Gregory Charles Paul still holds the record of being the longest serving Advocate General of Bengal. Going south, the King of Golconda had an Armenian in the post of Governor of Mylapore (San Thome) called Marcus Erezad. On the other side of Asia, Sir Paul Chater made his mark as a billionaire businessman, back in Calcutta JC Galstaun was doing the same through his property empire. The Armenian presence can still be felt today – there is an Armenian Church in every major city in India, the one in Calcutta’s Burra Bazaar being the oldest in the city, one of three in the city limits with more in the periphery. The architectural legacy still stands visible across the city, even the Chief Justice of West Bengal lives on, what was once, Armenian property. The culture has also permeated into the famous Bengali cuisine – an Armenian dish called Dolma, minced meat with rice and light flavours wrapped in a grape leaf – has been adopted and adapted to suit the Bengali palate and available ingredients: Potol’er Dolma. Armenian Christmas always turns up in the newspapers too. The modern branches of Christianity celebrate Christmas according to the Julian calendar on the 25th of December. The Armenian Orthodox Church is true to form, still abiding by the Gregorian calendar, so Christmas is celebrated on the 6th of January instead. In the very heart of Calcutta stands the Armenian College and Philanthropic Academy, one of the oldest schools in India and the birthplace of the British author William Makepeace Thackeray. Although not in the top tier leagues in terms of academic performance, the school has another platform to take on the very best of Kolkata’s schools – including their lifelong sporting enemy, La Martiniere – the rugby pitch. For decades, the rugby cup has been won by either the Armenians or La Martiniere. The Armenian College motto is "To know wisdom and instruction; to perceive the words of understanding", which is from the Bible and is the first sentence ever written in Armenian. Today, Armenians have wandered off the path. Their culture and religion have been abandoned by most. Many mistakenly identify themselves as Anglo-Indians, being the closest in terms of identity due to their language, food and general culture. Some have gently stepped into Indian culture too in their dress, language and inter-marriages. Is that strange? Does it seem out of the ordinary? Not if you consider that well before the Armenians ever left their nation, two Hindu Princes were said to have fled India and settled in Armenia 150 years before the birth of Christ. Anthony Khatchaturian is an Armenian and a descendant of Sir Paul Chater on his maternal side and JC Galstaun on his paternal side. Based in the UK and having worked for the Metropolitan Police Service ('Scotland Yard'), he has been in India since 2013 working to bring modern Indian history to life through walks, tours, heritage consultancy and heritage awareness, and will be releasing his first book soon. The Old Kenilworth Hotel, the second oldest hotel of Calcutta, is being torn down. Only recently, the Fairlawn Hotel of Shashi Kapoor fame changed hands. That both properties were owned by Armenian families is no co-incidence, however. On the atlas, the Eurasian Republic of Armenia looks like an ink splatter. Its area is slightly less than Kerala's. Its population, almost the same as Meghalaya's. It is then surprising to imagine that at some point, the people of such a tiny nation owned such a lot of Calcutta. They were mostly merchants who went on to build some iconic structures that adorn the city today - The Oberoi Grand, Stephen House, Park Mansions, Queen's Mansion - two clubs, several schools of which only the Armenian College and Philanthropic Academy (ACPA) and Davidian Girls' School remain, and three churches. The Armenian Ghat on Strand Road was also built by them and so also was the ghat near the Kali temple at Kalighat. Structures such as the Victoria Memorial, Saturday Club and Dalhousie Institute were built with generous contributions by community members. In fact, entire neighbourhoods were named after them - Armenian Street, Sookias Street. The Lower Circular Road Cemetery houses 332 Armenian graves. Ranajoy Bose of the Christian Burial Board, Calcutta, which looks after the cemetery, says , "Before the Marwaris came to Calcutta, the Armenians were the Marwaris of British India." But why did they come to Calcutta? And before that, when did they get here first? There is a quarrel about the when. The epitaph on the oldest grave in the Armenian Holy Church of Nazareth in the bylanes of north Calcutta's China Bazar dates back to 1630. It belongs to one Rezabeebeh, wife of Mr Sookias. But the church itself was built in 1724. Achinto Roy and Reshmi Lahiri Roy, co-authors of the paper, "The Armenian Diaspora's Calcutta Connection", quote existing literature on the Armenian diaspora to establish that Armenian merchants from New Julfa in Persia came to Bengal in the 17th century. In an email from Australia, Achinto tells The Telegraph, "The Armenians played a key role in securing the royal farman from the Mughals to enable the British to set up their trading posts in Calcutta. Armenian merchants played the role of middlemen in negotiating such deals as they had command over Persian - the Mughal court language - and were not subject to caste taboos, which made them comfortable dealing with people from other parts of the world." More than 300 years after the first Armenians arrived here, Andranik Matevosyan landed, under very different circumstances. Matevosyan was all of 11 when his mother broke the news. He was to be sent to Calcutta, a city 4,557 kilometres away from his home in west central Armenia's Ejmiadzin. Matevosyan had never been out of the country before, never been on a plane, scarcely ventured out of the neighbourhood even till then without parental supervision. But he had heard of Calcutta from television commercials about the ACPA. Something about it being one of the oldest Armenian educational institutions in the world. On January 26, 2001, Matevosyan and 31 others were bundled into a flight and that was that. Two days, two time zones and three flights later - Yerevan to Moscow, Moscow to Delhi and Delhi to Calcutta - they arrived. "The first thing I remember was feeling hot. January, in Armenia, is chilling; temperatures drop to 3°C. From there, we were suddenly at 21°C in layers of warm clothes," says Matevosyan. It has been 17 years since. Matevosyan has stayed on. He is not alone to have done so. His mates from that January day, Karen Mkrtchyan and Davit Gevorgyan, have not left either. Mkrtchyan graduated in German Studies from Jawaharlal Nehru University, Delhi, and Davit is pursuing a programme in Sports Management from George College, Calcutta. It is not just about one year or one batch. Every few years, for the past two decades, there has been a steady flow of Armenian students from Armenia, Iran, Iraq and other parts of India into Calcutta. The college - which seems to be the main draw and had witnessed an exodus with its student number falling to 1 in 1996 - currently has 85 young people in its registers. The three batchmates do not dwell on the memory of being uprooted or the difficulties of adapting to a strange land beyond the essentials - spicy food, strange language - but leafing through the 2015-16 yearbook, reading the accounts of the students, one gets a sense of the enormity of the shift. Almost all of them are about missing family and home, but they also articulate career dreams - becoming an architect or a lawyer. Reading these, it is not difficult to imagine working-class parents in a faraway land steeling themselves to take a giant leap of faith, only to secure the future of their young. But it is still not clear how one vintage institution can inspire such a huge move and if it is at all related to those 16th century traders. Talking to various community elders and the Armenian diaspora experts, this is what emerges - previous generations of wealthy Armenians have created a system that ensures most Armenians do not have to pay for their education in India. Take the case of Sir Catchick Paul Chater, who was born to a family of Armenian merchants in Calcutta in 1846 and later went on to become a business tycoon of Hong Kong. He continued to plough back generous donations to the city of his birth and for his people here. Co-ordinator of ACPA Armen Makarian tells us, "La Martiniere was in a grave financial situation at one point. That is when Sir Chater stepped in as a benefactor and his generous contributions have been the reason why Armenians get full scholarships to study here, even now." Meritorious students of the ACPA are, in fact, sponsored by the Armenian church and the college to continue higher studies in India in any stream of their choice from any university in India. Says Makarian, "Whenever Armenians leave the country, they submit their property related papers or money to the church. The church uses this corpus to bring students and pay for their education." In fact, the television commercial that got Matevosyan down here in the first place was by the governing body of the Armenian Apostolic Church - Mother See of Holy Etchmiadzin - which is also in charge of the college. And Mkrtchyan's mother was alerted by church authorities in Armenia. It does not end with the college and grants. The community has developed certain oases of familiarity in this alien geography to help the youth adapt. Matevosyan tells us about the Bara Club on Park Street and the Armenian Sports Club near Red Road. He says, "We gather there to sing, dance and eat. Every January 6, we celebrate Armenian Christmas at the sports club. Church on Sundays is another major social mixer." While a lot of young people returned to Armenia and Iran - where Armenians are the biggest minority community - after finishing school, and many more moved on to the US, France, Australia, a decent number stayed back in India. Another such construct of Armenianness is rugby. It is a known fact that all Armenians in Calcutta are die-hard rugby enthusiasts. But in the 2011 documentary, My Armenian Neighbourhood, owner of Old Kenilworth Hotel and coach of the Armenian College team, David Purdy, tells filmmaker Samimitra Das that Armenia is by no stretch a rugby playing nation. He says, "Before Armenians come to Calcutta, they are not rugby players. They learn it in the Armenian College." But this was not how it was in the interim years - in the run-up to Independence and immediately after. The 92-year-old Sonia John has seen and lived the denouement. She has a different story to tell when we meet her at her Ripon Street residence in central Calcutta. John, who married into the family that owned the erstwhile Continental and Carlton hotels, came to India in 1931 from Shiraz in Iran when she was only five. "My grandmother bought me here at the request of my father who had studied here. I came here and joined the Calcutta Girls' School and never saw my father after that. He died of pneumonia when I was 11," she says, her old eyes mirroring that child grief. John had a difficult time at school because she could not speak anything other than Persian and Armenian. Things changed for the better when she joined La Martiniere, where she met other children from the community. "A lot of Armenians also taught there," she adds. And in 1957, when she returned to Calcutta after higher studies in Delhi, and a couple of teaching stints in the city, she opened a private school herself. After Independence, things changed. Once the British left, the Armenians experien-ced for the first time a certain kind of racial animosity. Says Makarian of ACPA, "The Armenian community was here for business, so when business suffered they left the country - went to Australia, the UK, other places. During that time Armenia was under the USSR, so people couldn't go back to Armenia either." But the karmic wheel turned again and the Armenians were back in the city at the turn of the century. Today, Matevosyan holds a job here in the retail sector. Mkrtchyan is taken for a Himachali or Kashmiri and prefers it that way. Gevorgyan has developed a taste for spicy food. As Sonia John puts it, "Armenians basically are survivors." Now we know.